I love avocados. They are not only super delicious, they are also super healthy (see this website). And super easy to grow yourself. All you need is a pit, some toothpicks, a glass of water and some patience. Oh, and a warm space to place it in. 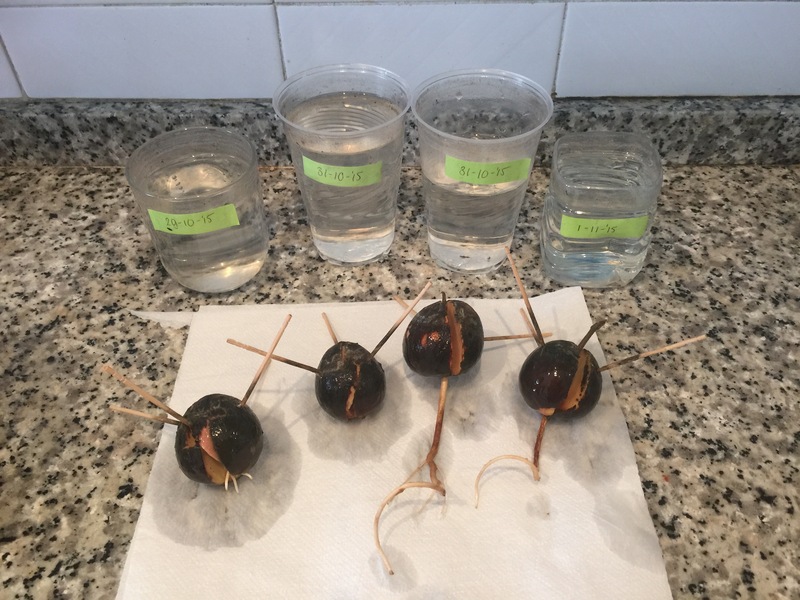 In this post, I show you how I’m growing four avocado plants from the seed and how you can grow your own. You can see how every pit sprouts at its own time and results vary greatly. Some might need a couple of weeks, some might need twice as long. And some might grow into beautiful fruit bearing trees, while others might not produce any fruits at all. For this experiment, I took four pits and ‘planted’ them around the same time, with only one or two days apart. I put them at a place near a window, but not with a lot of sunlight. I only have full sun at that window in the morning and during the day, in winter, it’s not very warm at that spot (I started this project around the first of november 2015). For me, the sprouting part took about two months, for some even three. I think that, if the temperature’s higher, sprouting might happen faster. So. How do I grow my own avocado tree? Of course, I understand that you’d rather start with getting your hands dirty and later maybe read about my personal results. So here it goes. To start, you need (ta daaa) avocado pits. You can obtain these by following the steps below. Besides the pits, all you need is toothpicks and a glass of water. Cut an avocado in half, from the top to the bottom. Gently squeeze the pit out or just dig in with your hands. When you do this, make sure that you don’t cut into the pit. This can damage it and it will become useless. When you have the intact pit out from the avocado, clean it under running water and rub it with your hands until all the fruit has come off and the pit is completely clean. Leaving fruit on the pit can cause fungus to grow, something you really don’t want. Also, keep the skin on the pit. The pit of an avocado has a top and a bottom. The top is a bit more pointy and the bottom is flat and usually has a round spot which is a different color than the rest of the pit. Take three or (for more stability) four toothpicks and pierce them firmly but carefully into the pit a couple of millimeters deep, right above the middle of the pit, in a downward angle. Now place the avocado pit over a clear glass of water (so you can see the roots when they are starting to grow), with the toothpicks holding the pit up to make sure it doesn’t completely go under. Putting the toothpicks in at a downward angle, will make your pit ‘hang’ in the water. (Putting it as low as possible will save you a bit of water.) Fill the glass with water up to the pit, but keep the top half always dry. Put the glass with the pit in a warm place, but not in direct sunlight. Then, just wait. While the bottom part soaks in water, the top part will start to dry out and will eventually crack. This is the part that can take a few months. I have found sources that claim that the best thing to do is to change the water daily, weekly or every two weeks, but honestly I think once a month will be more than enough. Some people say you shouldn’t change it at all. In those (almost) four months, I might have changed it three or four times, but I don’t really remember. Whenever the water looked dirty or I saw a slimey substance hanging around the bottom of the pit, I washed it off and changed the water. It can take up to two months before any roots are starting to show, so be patient in this stage. First, you’ll see a crack in the top (dry) part. Then, this crack goes all the way down to the bottom of the pit and then the roots will start to grow. The pit will eventually be cracked all the way through. NOTE: It is really important that you never ever let the roots dry out. This will kill the pit immediately and you’d have to start all over again. After roots are starting to grow, a stem will appear from the top. This can take another couple of weeks. When it reaches the 15 cm (6″), you need to exchange the glass of water for a pot of soil. The soil that is best for your avocado tree, is soil that is moist, with a PH of around 6/6,5. Use a pot that is about 20-25 cm (8-10″) in diameter and soil that doesn’t easily dry out. The soil of your baby avocado tree should always be moist, but never wet. If you have trouble sprouting your pit, you might want to try to slice off a bit of the top and a bit of the bottom part of the pit before putting in the toothpicks. I haven’t done this myself, but will try this next time. As you can see in the picture (taken almost four months after the start of my project), the sprouting process went very differently in each pit. One grew very big roots and a short stem, while one grew short roots but a longer stem. One broke open and grew tiny roots, but no stem at all. And the last one broke open a bit, but didn’t seem to have done any growing at all, not from the bottom, nor from the top. Because in one pit, the roots had already grown so long, I decided to put it in a pot when the stem was actually still too little. Let’s see how it goes. On this page, I will post updates about how my pits are growing. Also, I’d like to do a bigger experiment. I have saved up a lot of avocado pits and I’m currently looking for a new appartment, so I can’t wait until I have the space to start growing all of them! For more info on how to keep your avocado tree once it’s grown, stay tuned. I have another post coming up, in which I tell you all about how to do that. Have you ever grown avocado trees? How long did it take you to grow fruits? Do you have any tips or tricks? Share them with us in the comments below!